Jo doesn’t know why she inherited a magical ring. She doesn’t know why her father abandoned her when she was a baby, or the truth about her mother’s death. Jo doesn’t know a lot about her past. Nearing her eighteenth birthday, she’s about to discover what really happened to her father all those years ago. She’s on a new path, a path including her first love, a path that will lead to the truth about a family secret held for generations. Jo’s about to face her first real challenge. ‘Reflections’ is just the beginning. Tricia: Hi Jacoba and thank you for joining us today. Congratulations on the publication of your book. Can you tell us a bit about yourself? Jacoba: Well, my most important job is being the mother of two beautiful boys. I live in the not so sunny capital of Australia. (It actually snowed here the other day!) I work part time teaching students who are learning English as an additional language and helping children with their literacy skills. Jacoba: I always loved writing at school. And always had the thought that I’d love to write a book one day. But doesn’t everyone? I never thought I’d actually manage it. And it took quite a few years for me to give it a go. Reflections is that ‘go’ and I wrote it about three years ago, not long after the birth of my second child Jack, who features in the novel as Beth’s little brother. Tricia: How did you come up with the idea for the Eternal Curse Trilogy? Jacoba: My grandma, who lived in England and I only met once when I was young, gave me a copy of Alfred Lord Tennyson’s collected works, when she visited Australia. She received it as a prize from school and from that day on, I was in love with ‘The Lady of Shalott’ poem. I often wondered about it. What it would be like to be cursed and not really understand why, and to watch life pass you by, and not have the choice to interact with anyone. But my story, although inspired by the poem is not a rehash of that poem. It’s funny how a story evolves though. I never really had it all mapped out from the beginning. It kind of mapped itself out in the end. Tricia: What is Jo’s greatest challenge in Book One: Reflections? Jacoba: Well, I guess her greatest challenge is accepting there is a challenge. To recognize just what’s really going on and not to accept her circumstances, but to start questioning her life, and how she wants to be perceived and treated by others. Tricia: In addition to Jo’s unique situation, she also struggles with typical teenage issues. What are these issues and how do they contribute to the main conflict in the story? Jacoba: Well the obvious is the sibling rivalry with Gabriella. And although this is somewhat caught up in the effects of the curse, I think this can be an issue for a lot of teenagers. And lastly she has no experience with boys, and doesn’t have the confidence to start a relationship when she finally finds someone she likes. 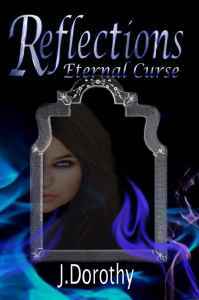 Tricia: When I first had the pleasure of reading Reflections, I was impressed by the way you cleverly wove important moral lessons into the fabric of the story. What lessons do you want your readers to take with them after reading the story? Jacoba: This is a tough one, because I’d really like the reader to come away with their own interpretations of the story. Every one of us has different life experiences and reacts to stories in different ways. I guess though, for me as the author, the biggest lesson that come through the story, is the message that everyone should learn to believe in themselves, and accept that everyone has their strengths and weaknesses. Some very powerful changes have happened in the world because people have held tight to their self belief. Bit like me writing the story, I had to believe I could do it, or it would never have been finished. And I wouldn’t be pinching myself right now!! Tricia: Without giving away too much of the plot, what can we expect in the next book in the trilogy? Jacoba: Ah, seeing as it’s a continuing story, it’s a bit hard to comment on that one without giving too much away. I will say, the gangs all back in the next one, with some colourful new characters who I adored writing, and hope readers will like. Jacoba: I am a bit boring on that front. I’m currently ferociously editing the next two books. But I do have one book that I’m half way through. Bit of a spoof on an old classic fairy-tale, called Cold Grey. I’d like to finish that one day. I’d also like to finish writing my memoir (which I have fictionalized) about having Jack. And I have an idea for a new YA fantasy but haven’t got much passed the first couple of chapters. That’s the fun of this writing game, there are so many ideas spinning around in your head, you just have to pluck out the ones you want to work with and see them through to the finish. Tricia: How do you juggle the demands of daily life with your writing career? Jacoba: This question makes me laugh. For one, my husband would answer this soooo differently … for another I have become very good at multi-tasking. I can type while reading ‘That’s not my robot’, Jacks favourite book. And I am very good friends with the pizza delivery boy and the tv remote. Tricia:. What inspires you as a writer? Jacoba: Now that one’s easy … other writers. I love to read and read and read some more. I so want to kiss the person who invented kindles. Who was that anyway?? Tricia:. What advice do you have for new and aspiring writers? Jacoba: Oh gosh. Where to start? I’d have to say first and foremost, love it! If you don’t love it, you won’t be successful, because it requires copious amounts of perseverance and patience. If you go to bed at night thinking of your stories, and you wake up in the morning with the same thoughts, then you’ve got the bug, and you have to write them down, or you’ll be bugged for eternity. Believe in your story and yourself. There will be lots of road blocks along the way, but it’s all worth it in the end, you just have to keep going. And, EDIT!!! Then when you think your stories edited, edit it some more. Lastly, enjoy the journey, I have made so many lovely friends (Tricia being one) and learnt so much. And that’s what life’s all about really. Tricia: That is great advice. Thank you again, Jacoba, for taking the time to speak with me. I'm looking forward to the rest of the series. Anyone who hasn't grabbed a copy of this amazing book should hurry to Amazon right now. Reflections is a fab book. It's so nice to find out more about the origins of a story. A lovely interview from a lovely lady and a very fine writer.Looking forward to book 2 of the trilogy.